The New Year marks a new start for the Group with our meetings now being held on the fourth Wednesday of each month and not the third Wednesday as previously. Our first meeting of the year will be held in the Village Hall on 26 January when our speaker will be Mr Brian Abell who will give an illustrated talk on his home town of Hatherleigh. The meeting starts at 7.30 p.m. and all are welcome. Moving forward to March, the HLHG has been invited to join the Hatherleigh History Society to celebrate their thirty years as a group with Radio Devon’s Tony Beard in attendance. “The Wag from Widecombe” has agreed to come along and give a talk on the history of Widecombe-on-the-Moor where his family has lived for generations. At the moment, it is planned to hold this event in the Hatherleigh Methodist Chapel (opposite the public car park) on Monday, 14 March, commencing at 7.30 p.m. This should prove to be a very interesting and entertaining evening. There will be a small charge of £2.00 per person on the door, with paid-up members of the Hatherleigh History Society paying £1.00. At the January meeting we were joined by Brian Abell, the Hon Secretary of the Hatherleigh History Society, who gave a most interesting talk and slide show on the history of the town of Hatherleigh, where his family have resided since the marriage in Hatherleigh Church of his ancestor Henry Abell to Alice White in 1631. Many of the photographs shown were of properties that no longer exist, having been swept away in the name of progress! 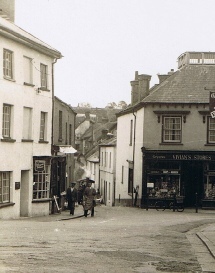 One such property was Vivians Stores pictured here on the left. The February meeting saw the chairman present a slide show of the recent school centenary celebrations, together with scanned old photographs of village life at the turn of the previous century. All photographs of the event shot by Rodney Parrish and Maurice Thomas are now on a CD and deposited with HLHG for safe keeping together with a DVD of the reunion day taken by Steve Bridges. The Guest Book and the scrapbook, compiled and donated by Michelle Ody, have also been kindly handed over to our archives for security. For the March meeting we joined forces with the Hatherleigh History Society to celebrate their 30th anniversary when Tony Beard of Radio Devon fame gave a lively talk on the history of Widecombe on the Moor. Because of an expected increase in numbers, the meeting was held in the Methodist Church instead of the usual venue in the Hatherleigh square. Our next meeting in April will be the AGM in the Village Hall when all will be welcome. Date to be advised. The Highampton Local History Group has recently been sent a copy of the first newsletter of The Devon Rural Archive, which makes interesting reading. Members can view it by visiting their website at www.devonruralarchive.com where you will also find a list of upcoming events in which you may be interested. The Devon Rural Archives was established in 2006 and is situated in the heart of the Devon countryside in the grounds of the Shilstone Estate near Modbury. The DRA provides a much-needed resource for historians, archaeologists, genealogists and the general public studying the heritage of the County. Their focus is clearly to promote a greater understanding of our county’s rural history, architecture and landscape and their resident archaeologists undertake site visits and report on houses identified in the 1765 Donn map of Devon. As a matter of local interest, Burdon Grange, the Golden Inn and the Church are all clearly marked on Benjamin Donn’s map of that year. 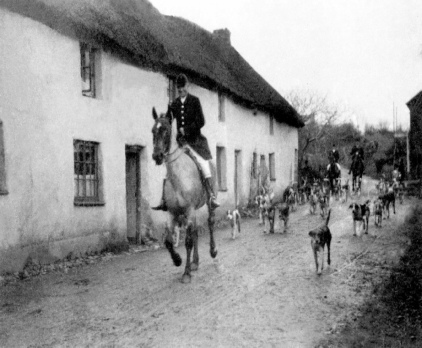 Our chairman is currently compiling a history of the local South Tetcott Hunt and has been given a photograph of the renowned huntsman Phil Back, who wrote the book ‘From Terrier Boy to Field Master’, now long out of print. The photograph depicts Phil Back leading what appear to be Mr Scott Browne’s hounds, through a nearby village. Can anyone recognise the cottages or have any information relating to the subject? If so, Maurice Thomas will be very pleased to hear from you. He can be contacted on 01409 231460. The Annual General Meeting of the HLHG took place in the Village Hall on Wednesday, April 20. The Chairman gave his Annual Report and said that the group had had another successful year, with the attendance of a number of guest speakers and slide shows, as well as an interesting visit to Locks Park, Hatherleigh. All the officers were re-elected, namely: Maurice Thomas, Chairman; Charles Dumpleton, Vice-chairman; Maureen Morrel, Secretary and Jane Bridges, Treasurer. Mary Dayman asked to step down from making tea at the close of meetings, a role she had diligently carried out since the group’s inception, for which she was warmly thanked. Carole Ward kindly offered to take on the task for the coming year, in addition to running our website. The AGM was then followed by the monthly meeting in which members were entertained to a most interesting and informative talk by Mr and Mrs Michael Madders on the Alfred Chapman Diaries of 1869. 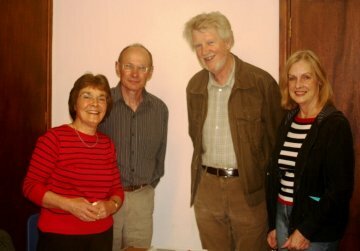 Michael and Mary Madders (shown here on the left of the photograph) are members of the newly formed Merton History Group and the extracts from the diaries gave an insight into the everyday life of Alfred and his family. There is still a family of Chapmans in Highampton and it is quite probable that there is a family link. Mary Madders had very kindly baked a Victoria sponge which all enjoyed at the end of the evening with a welcome cup of tea or coffee. Notes of Interest: Photos of Lower Longwood and Primrose Cottage, Burdon Lane, have been added to the Village Gallery. 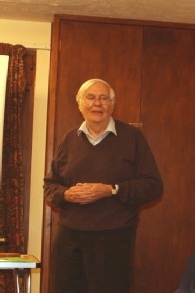 For the May meeting the members were entertained by the local historian John Leach who gave a most interesting and informative talk on the evolution of cathedrals. Reverend Leach illustrated his talk by numerous colourful slides that showed the construction of these great buildings from early church history to those that were constructed more recently in the 20th century. At the end of the meeting a copy of a poem written by Jane Eedy to mark the tenth anniversary of the outbreak of foot and mouth in Highampton was placed in the archive for posterity. Also lodged were a number of newspaper cuttings from the Western Morning News that related to the foot and mouth epidemic and also to the extension to the school and the parish website launch. These had been gathered together by Charles Dumpleton. Highampton Messenger has now been going for a year and the first year’s publications have been bound and added to the archive for safekeeping. Pictured on the right, Secretary Mo Morel assists John Leach during his talk on the building of cathedrals. The June meeting of the HLHG was held in the village hall on Wednesday, 22nd June and was very ably chaired by the Vice Chairman, Charles Dumpleton, in the absence of the Chairman, Maurice Thomas. Maurice was due to go into hospital for heart surgery and the members all wished him a full and speedy recovery and signed a card wishing him well. The normal monthly business of the Group was discussed including a reminder from Maureen Morel about the forthcoming Highampton Community Fun Day to be held on Saturday, 2nd July, an event organised jointly by the Highampton CP School PTFA and the Highampton Village Hall Committee. The members were then entertained by Mr Denis Bater who gave an informative talk on the history of Winkleigh Aerodrome. He illustrated his talk with a number of slides not only giving views of the aerodrome and its construction but also aerial shots showing the runway, the flight path and the surrounding countryside. He also showed photographs of several members of air crews stationed at Winkleigh during the latter part of WW2 and added his own personal memories of events of that time that he had experienced as a young child growing up nearby.